NBA players earn a suspension with their seventh technical foul of the playoffs. Kevin Durant is off to a strong start, picking up a pair Saturday in Game 1 of the opening-round series between the Golden State Warriors and Los Angeles Clippers. In case you’re not aware, that’s the maximum amount of technicals before a player gets tossed — which he was for his spat with Patrick Beverley that earned both players ejections at the end of a game the Warriors easily had in hand. 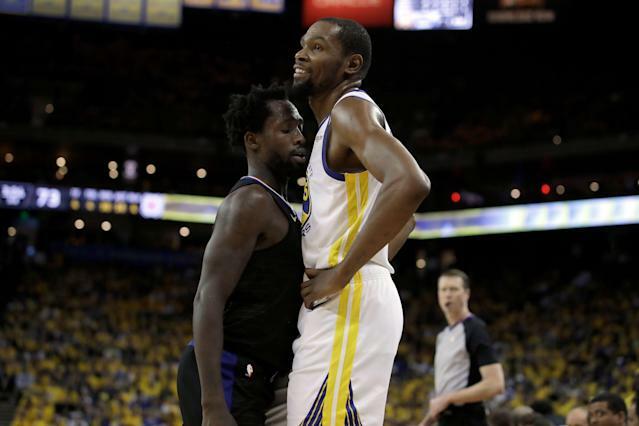 Durant appeared to not take the ejection too seriously; he was seen laughing and slapping fives with his teammates after being tossed. But sources told Yahoo Sports’ Chris Haynes the Warriors did take it seriously and are concerned about the implications of their best player working on a pace to get suspended for a playoff game. That’s a message that apparently made its way to Durant, who apologized on Monday for the pair of technicals. “I don’t wanna disappoint my coaches, my fan base, and owners who expect me to be out on the floor so I apologize,” Durant told reporters during a Monday media session. Asked how he planned to avoid trouble with officials moving forward, Durant described a simple plan. Can Kevin Durant control himself? While the contrite tone was new, his plan reflected his response on Saturday when asked if he was worried about being suspended. “Nah, I can control myself,” Durant said. Saying he can control himself and doing so are two different things. And Durant’s past doesn’t suggest he can. Durant picked up 15 technical fouls during the regular season and is notorious for being easily baited to engage in arguments with fans on social media — whether using a burner account or a verified one. Durant seems to be in a constant state of agitation that shows itself on the floor and in dealing with the media. Beverley’s job is to get under better players’ skin and bait them into reacting in a way that results in a technical foul or an ejection. Everyone around the league knows this, Durant included. Yet he still allowed himself to be targeted in the waning minutes of a game that was well in hand. The Warriors have fallen victim to this before, watching Draymond Green earn a suspension for a critical NBA Finals game in 2016 that they lost as the Cleveland Cavaliers won the championship in seven games. It’s easy to understand why the Warriors felt the need to address Durant’s technicals from Saturday. It appears Durant got the message. Whether that message translates to behavior change on the court is yet to be seen.